I've been having fun with Ranger Distress Oxides, making backgrounds for my cards. Using yellow, orange and purple, I applied the colors to a strip of watercolor paper. Then I sprayed it with water, blotted, added more color and repeated the process until I was satisfied. Next I attached strips of scrap Halloween themed card stock to a piece of card stock slightly smaller than the black card blank. After all the strips were attached I trimmed around the edges and added the watercolored strip with the die cut black silhouettes. (I cut off the umbrella and added a die cut bat but didn't glue down its wings.) For the words, I used a strip of Doodlebug washi tape that I had in my stash. 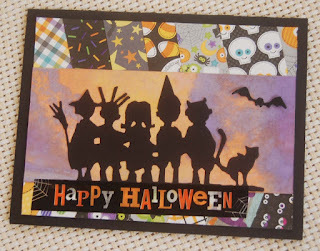 I am happy with the way this card turned out and especially glad to use up more paper scraps. Hope that you will have a safe Halloween....be happy and eat all the candy you want!!!!! Even though many dogs think squirrels are annoying, I think they are adorable. 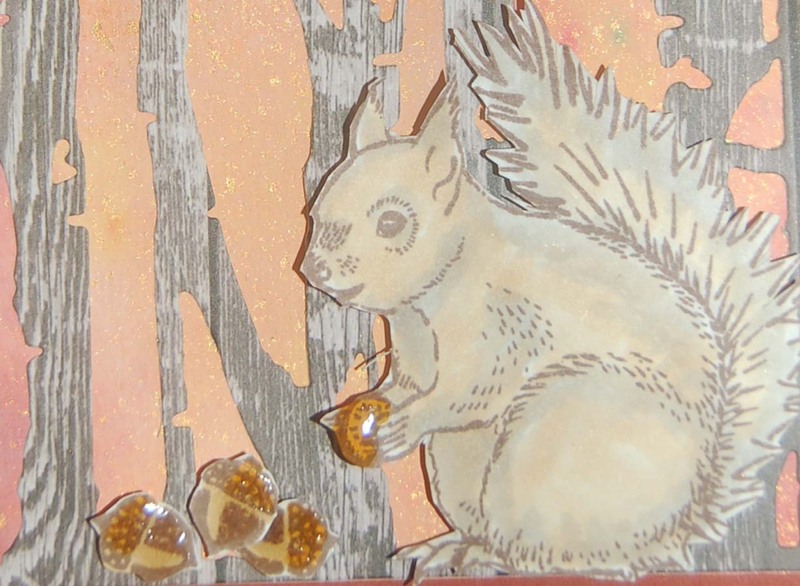 When I saw this squirrel stamp in a freebie set from a card making magazine, I just HAD to buy the magazine. 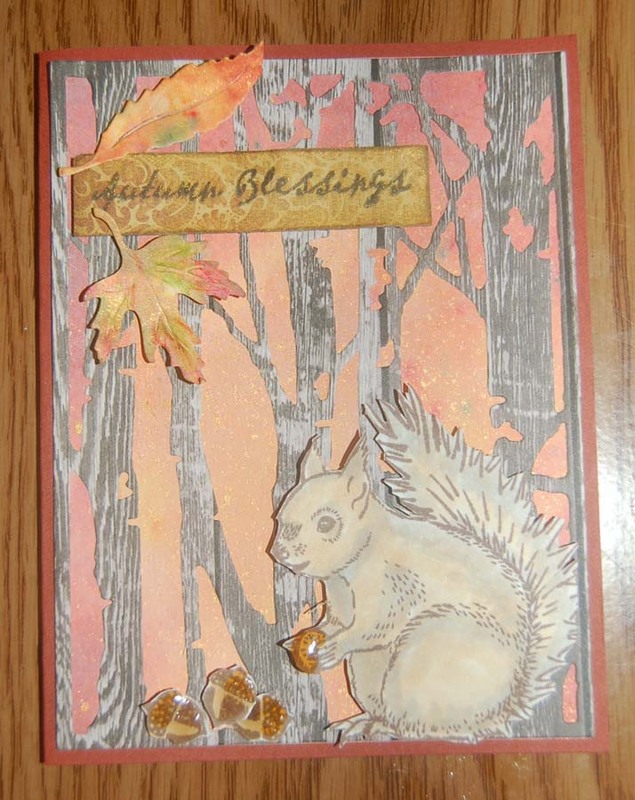 I paired the Copic colored squirrel image with a Sizzix die cut of barren trees. The trees look pretty realistic because I used a woodgrain print card stock. For the sunset background I used Ranger Distress Oxide Inks and sprayed the watercolor paper generously with water. For a little sparkle, I used a stiff brush to flick on some gold ink. 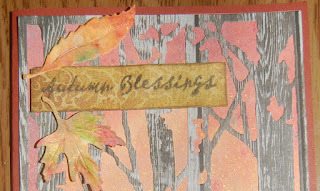 Here is a better look at the gold flecks which I also added to the Little B die cut leaves. I now appreciate Mother Nature more as it took lots of color adjustments to get the leaves to look realistic. 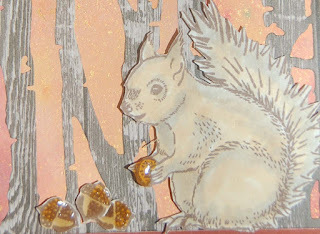 A little Crystal Lacquer on the acorns gave them a nuttier appearance....see the squirrel is smiling! 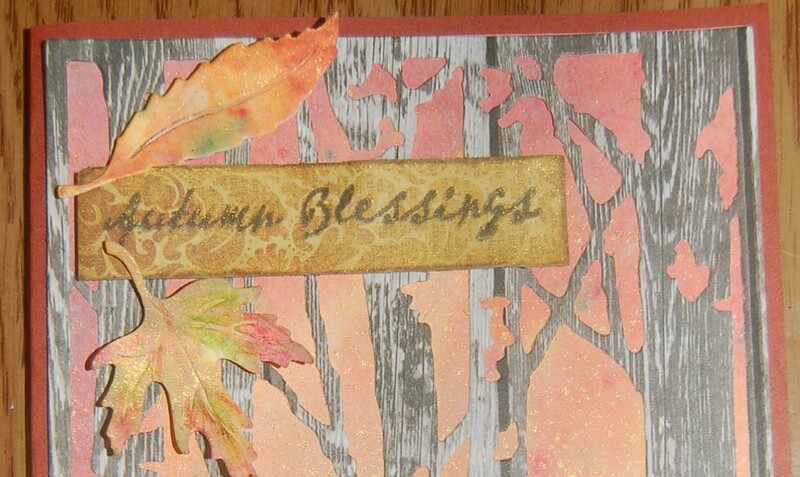 I hope this card make you think about your Autumn Blessings and look forward to blessings all year. 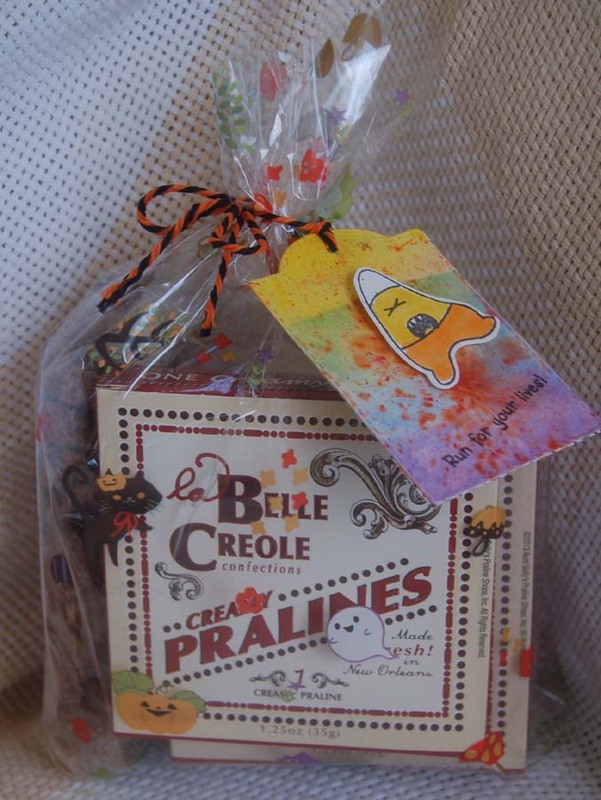 Who says that Halloween treats have to be candy? After making solid lotion bars using supplies I purchased at HM Ben Franklin Crafts, I had a Halloween idea to put the lotion bars in Halloween matchbox treat boxes (purchased in a make it yourself kit at HM BFC). The matchboxes are super simple to make and provide the perfect container for cellophane wrapped and washi taped solid lotion bars. 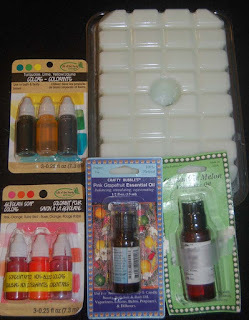 (The lotion bars need to be wrapped because the oils will stain the matchboxes.) 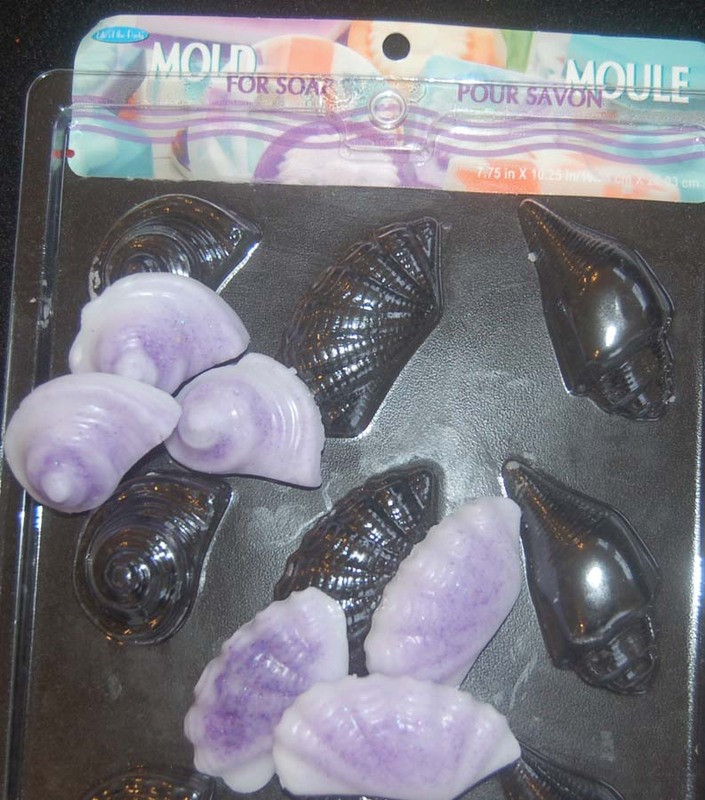 Be sure to tell the recipient of the lotion bar treat that it is for smoothing skin NOT eating. 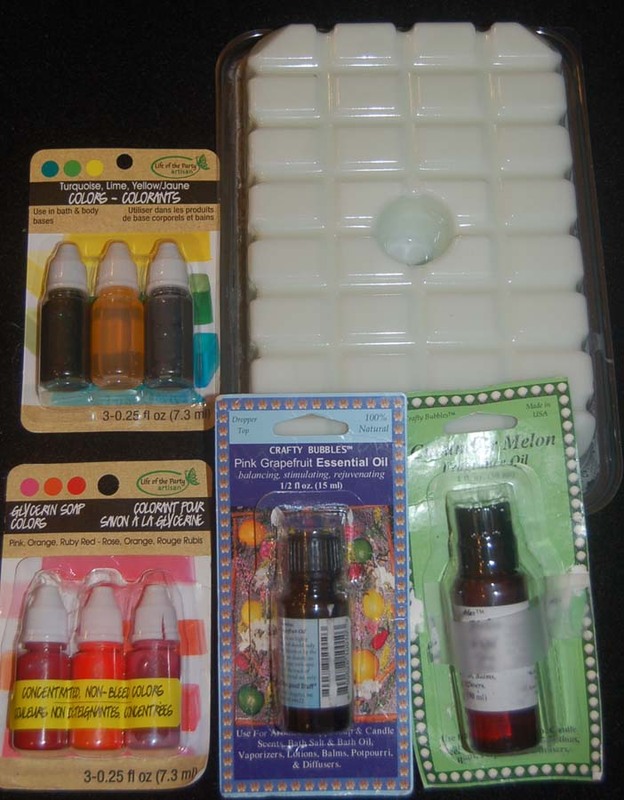 Like the soap and lip balm in previous posts, the unscented, colorless base comes ready to microwave and can be varied with many scents and colors available at HM Ben Franklin Crafts. To add more interest to the lotion bars I added some cosmetic sparkle powder (from HM BFC) after the microwaved liquid has cooled down a bit. The scents and colors can be added at this time too. 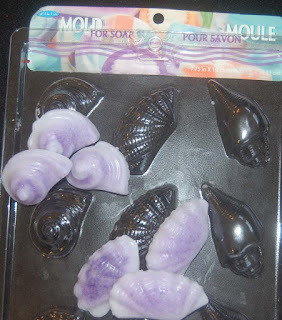 Tip: To easily remove the lotion bars from the mold, put the filled mold into the freezer for a few minutes and the bars will just pop out. 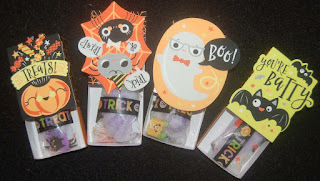 Well, hope you have lots of spooky fun this Halloween and give body lotion bars to all your special friends! 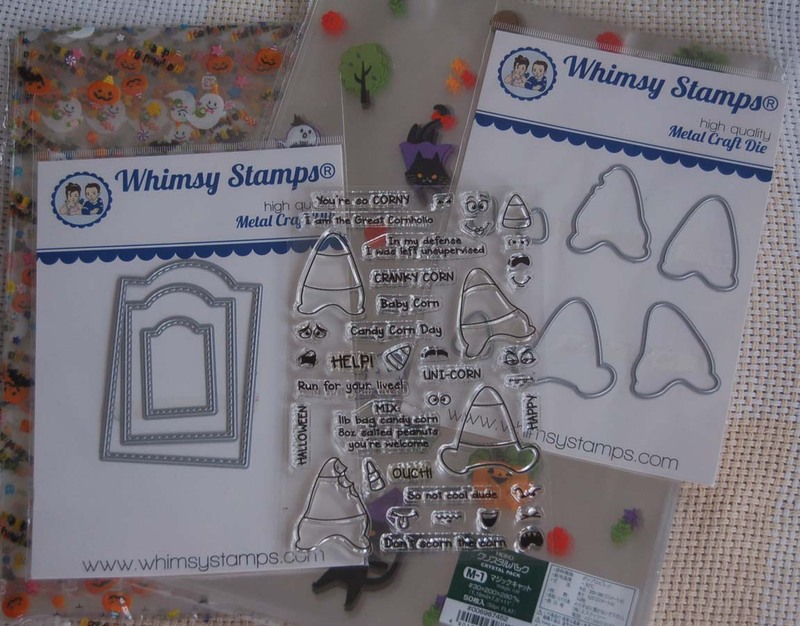 As a kid, candy corn was my favorite Halloween candy, so when I saw the Whimsy Stamp set and dies, I had to get them. 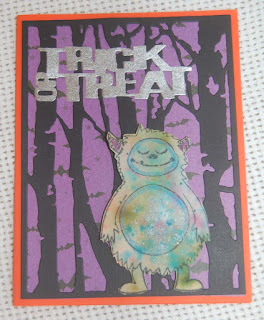 I used the tombstone shaped dies to cut the tags from watercolor paper that I had splattered with Kuretake watercolors and Ken Oliver pigment powders. 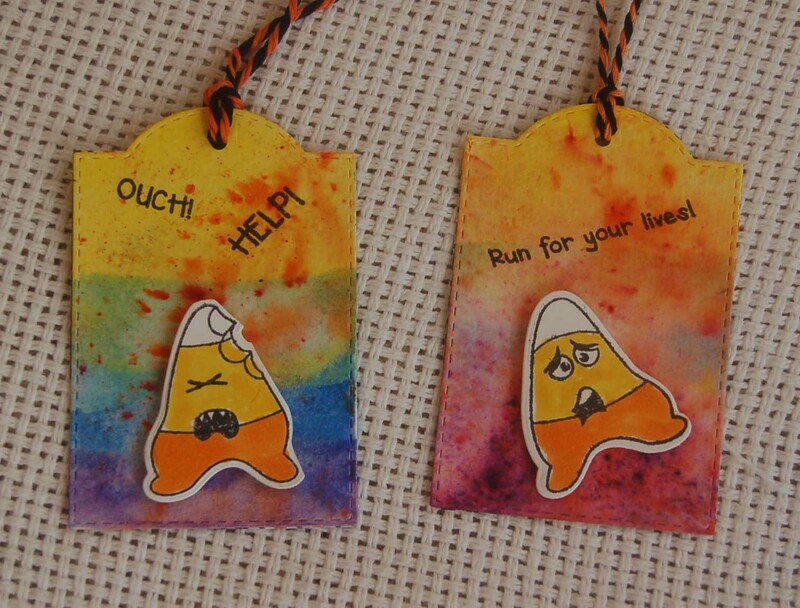 (Both color mediums can be purchased from HM Ben Franklin Crafts.) I love the funny sayings and facial expressions that come with the stamp set. For the back of some of the tags, I added a smaller black die-cut tombstone so that I could write a message with a white gel pen. 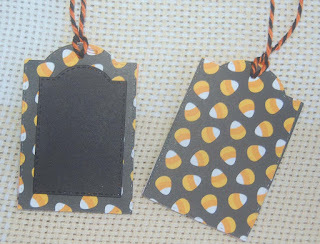 Here is what a tag looks like fastened to a cellophane treat bag (from Celebrations). 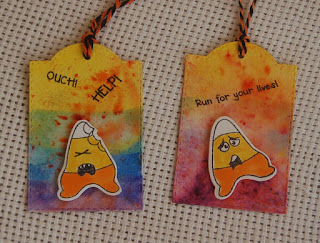 If I have time, I will make tags or cards using the uni-corn stamp....so cute! I love unicorns almost as much as candy corn....LOL! 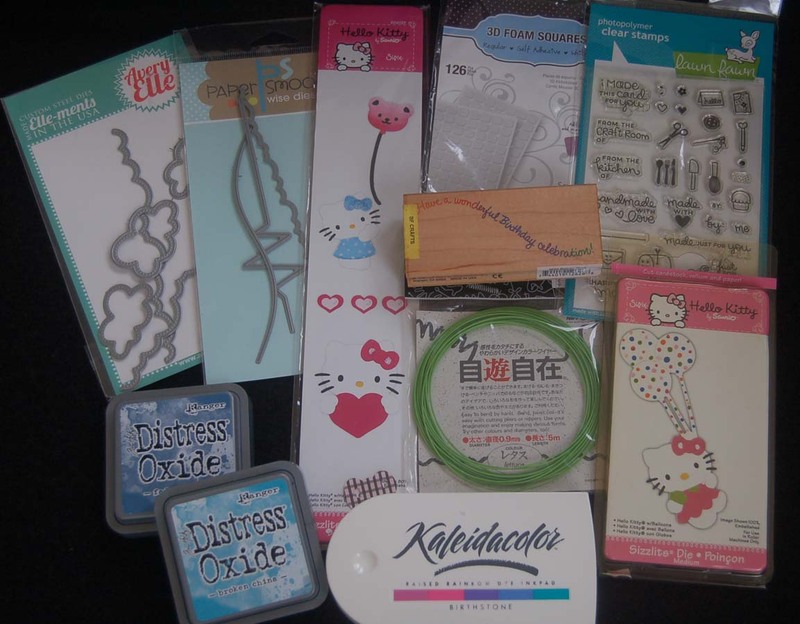 If you've been to HM Ben Franklin Crafts recently, you probably noticed all the wonderful supplies for making beauty products. It really is super easy to melt a soap base in the microwave, add some fragrance and colorant, then pour the mixture into a mold. Voila! You have beautiful handmade soap bars to give to your lucky friends. In the photo above, the pink is a citrusy grapefruit, the yellow is a refreshing lemon (I added finely grated lemon peel for texture and scent. ), and the green is a yummy melon scent. 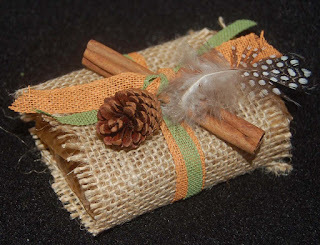 For a Thanksgiving dinner favor, you might want to wrap the soap in unbleached wax paper,burlap cloth and fiber ribbons, then embellish with a pine cone, a cinnamon stick and a feather. 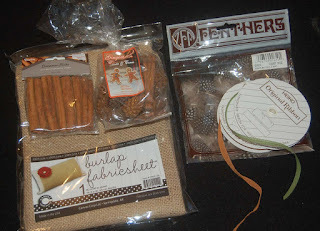 All of these items can be purchased at HM Ben Franklin Crafts. 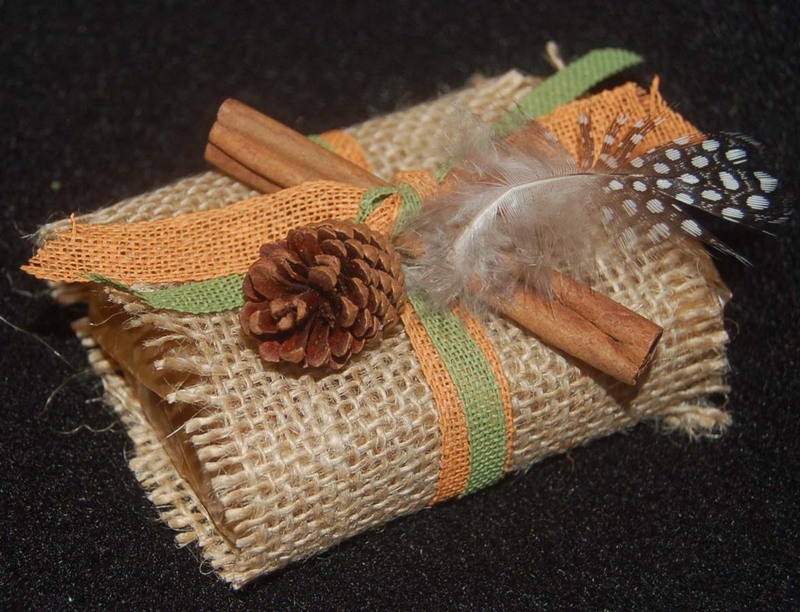 The soap under the burlap has a sweet almond fragrance to which I added some raw oatmeal for texture and its skin-soothing quality. For the soaps in the first photo, I used these items. 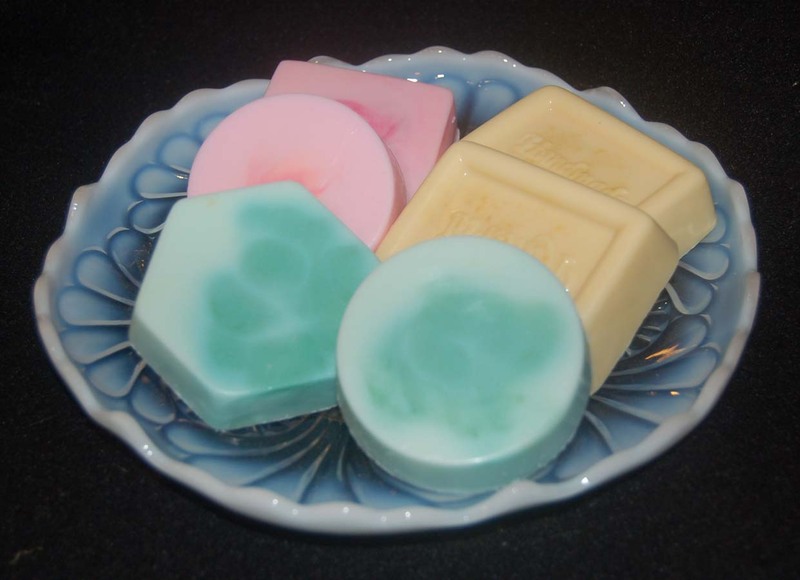 The soap blocks are available in goat milk, avocado and shea butter. 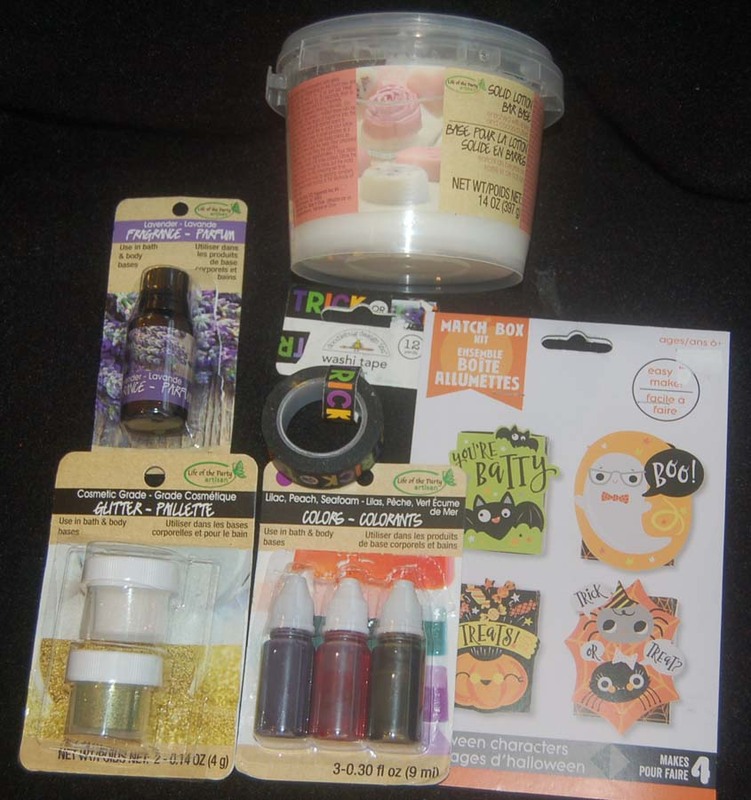 There are many scents and colorants to choose from at HM BFC. I truly enjoyed the ease of making these soaps and I'm very pleased with the quality of the finished product. I hope you will try your hand at soapmaking. It will leave you bubbling over with joy! The Sizzix 'Birch Trees' die was the start and inspiration for these Halloween cards. I visualized the idea of monsters in the forest during Halloween. 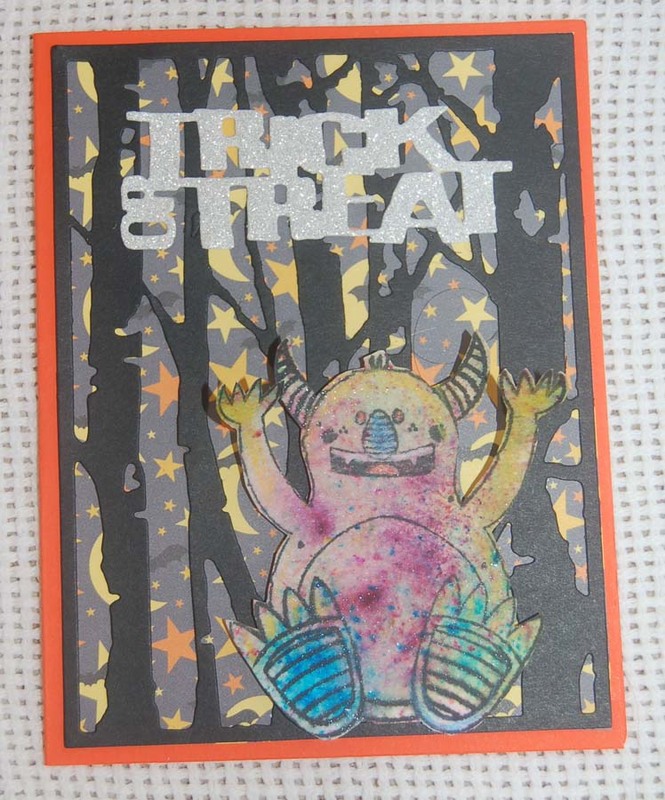 The Bo Bunny monsters were stamped on watercolor paper with Momento black ink. Then they were sprayed with water before applying Ken Oliver powder colors. More water was sprayed on and blotted off to get the desired color effect. After the monsters were dry, they were cut out and color pencils were used to highlight the details. 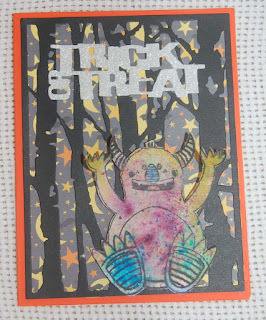 I like the randomness of the splotches on the monsters and how they remind me of the creatures in the Wild Things book. 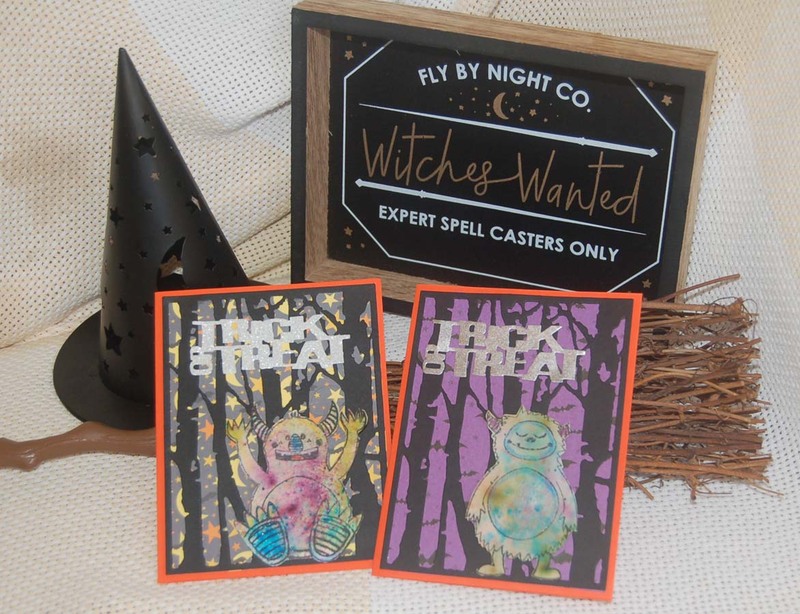 Both cards are similar but the background papers (from a 6x6 Halloween paper pad) give them a different appearance. 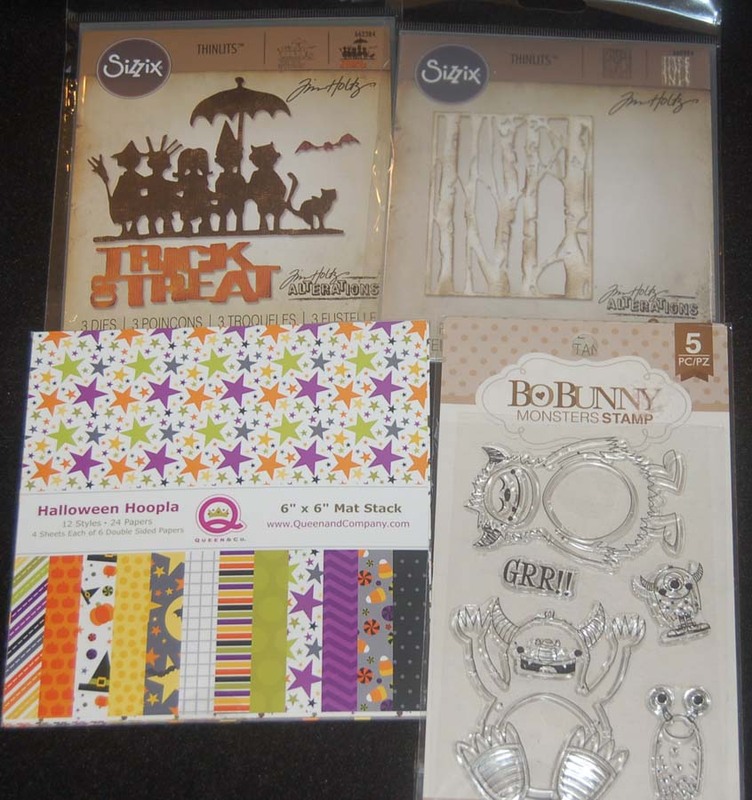 Another Sizzix die was used for the words which were cut out from silver sparkle paper. The monsters also have a bit of sparkle due to the application of silver metallic ink. 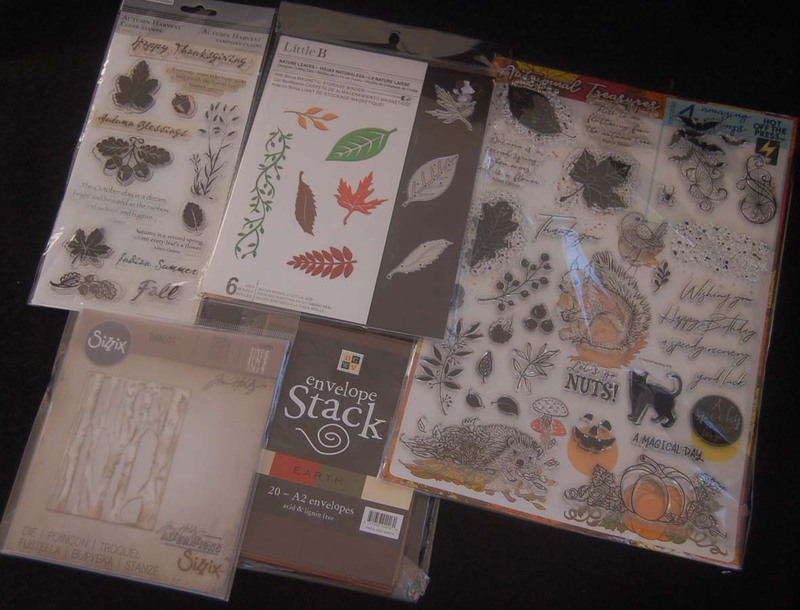 I will be using the birch tree die in the future to make autumn and Christmas cards. 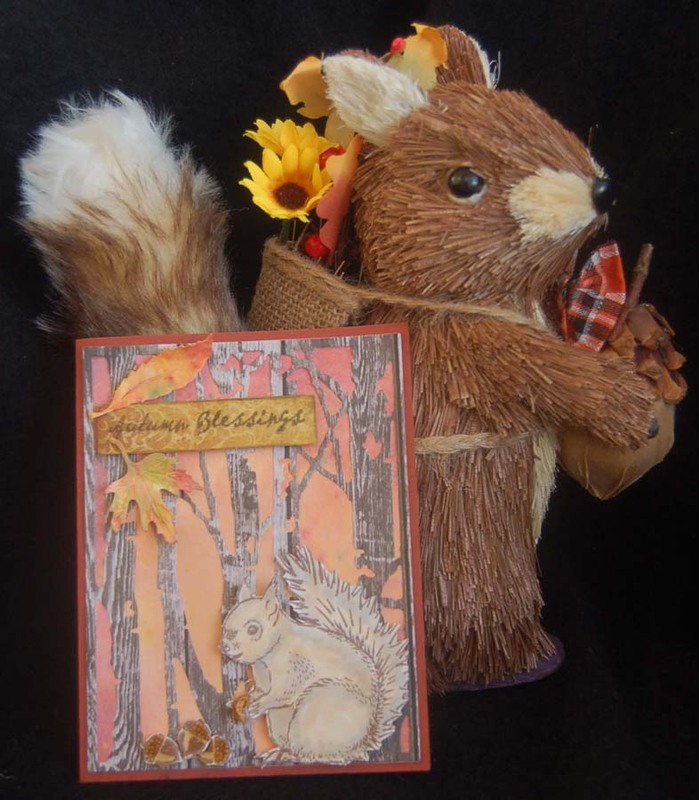 Please stop by this site again to see how easy it is to change up the paper and die cut a different seasonal scene. Trick or Treat! Don't get caught by monsters with smelly feet! While shopping at HM Ben Franklin Crafts, I purchased the cutest Darice Halloween Finger Puppet kit. This kit makes 3 adorable felt finger puppets. 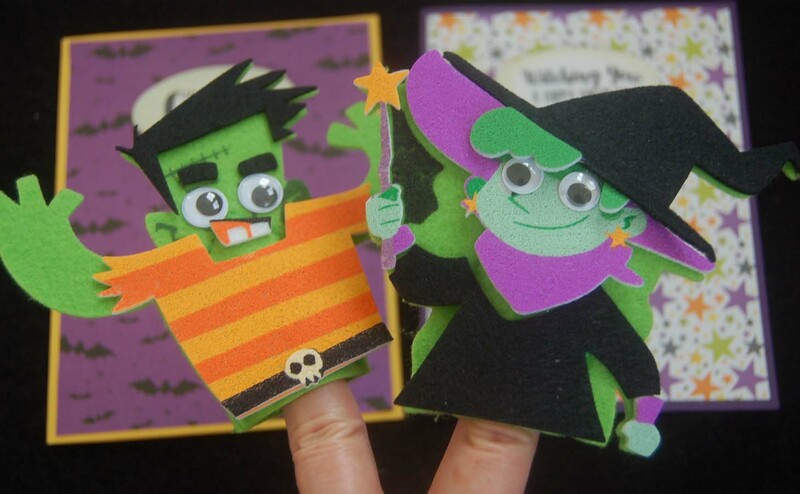 These peel and stick puppets are so easy to make that even a young child could make them. If you have a far away child or one that can't eat sugar, these puppets are a 'sweet' Halloween gift. I simply added some printed paper to a solid card and die cut labels for the sentiments. Aren't the puppets awesome even on my old fingers? I love the googly eyes that come in the kit too! 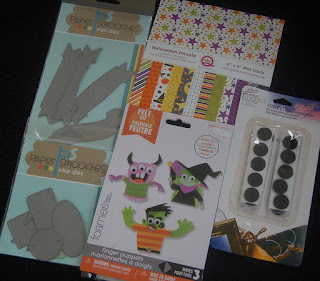 Here is a view of how I placed Darice Velcro dots on the card and puppet so that the puppet can be worn and wiggled. For extra strength, I put a dab of glue under the dot on the felt side as the dot sometimes comes off the felt. I hope you'll go to HM Ben Franklin Crafts and see all the spooky, cute Halloween items for sale there. 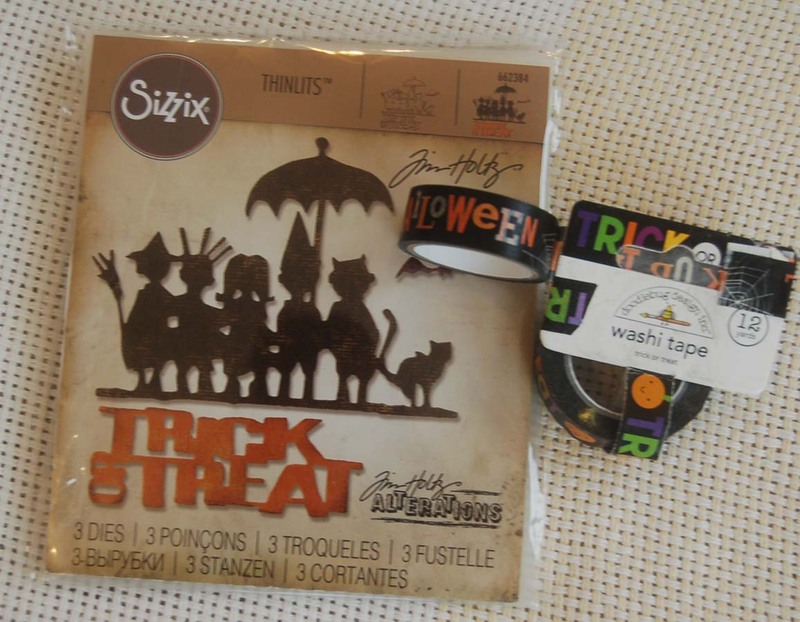 Happy Halloween shopping! Recently, I saw a card in blogland that had a really great cloud background. Simple instructions explained how to achieve the look using Distress Oxide Ink (Ranger), a cloud die and a water spray bottle. After one non-cloud try, my second attempt was acceptable enough to make into a card. 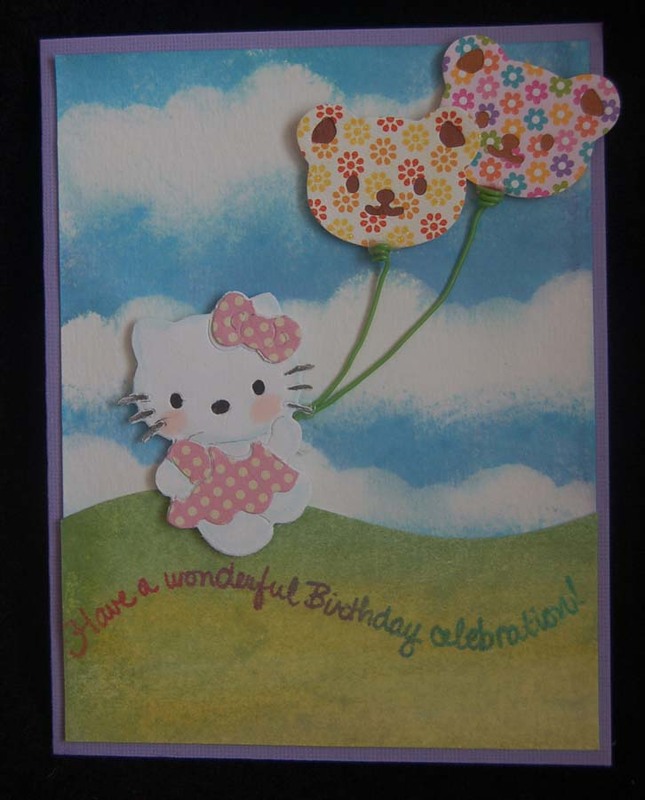 Because my daughter-in-law and I are Hello Kitty fans, I decided to dig up my old Hello Kitty dies to make her a birthday card. The dress and bow were paper pieced and rather than deal with the tiny eye, nose and whisker pieces, I glued a piece of black paper behind the face and penciled in the whiskers. The dies for the bear balloons came from a different die set and I used two die cut pieces to represent my newborn identical twin grandsons. For the balloon strings I glued on Nipoly wire that used to be sold at HM Ben Franklin Crafts. If you don't have any colored, flexible wire in your stash, you can substitute twine. The sentiment was stamped with a very old Stampendous wooden handled stamp and Kaleidacolor ink. Also in the photo are packages of 3D foam squares (my favorite brand from BFC) and Lawn Fawn 'Just For You' stamp set (to fancy up the back of your handmade cards). I hope this card encourages you to try your hand at making cloud backgrounds. If you need a detailed explanation, write to me at lsakami@aol .com and I will be happy to answer you. "I've looked at clouds from both sides now, from up and down and still somehow, it's cloud illusions I recall, I really don't know clouds at all"....Joni Mitchell.